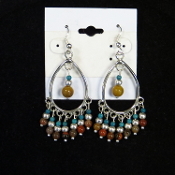 These are AZ Petrified Wood and Turquoise beaded dangle earrings. Each piece will vary slightly from photo. This item ships free anywhere in the continental USA. These are AZ Petrified Wood and Turquoise beaded dangle earrings on a post. Each piece will vary slightly from photo. This item ships free anywhere in the continental USA.